[Leader of the Blue Skies]This title is an unofficial, amateur translation. 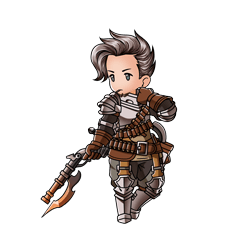 The hotshot helmsman girds himself in a new suit of armor as he prepares to guide the young skyfarers on the next leg of their journey. No one loves the ship more than he, and no one is more resolute in their determination to protect their friends. Demolishing Drive Massive Fire damage to a foe. ⇧ Lvl 55This skill is enhanced at level 55. 200%-250% Fire damage to a foe. (Damage cap: ~270,000). Charge bar cost reduced to 10%. on all foes in Overdrive. 70% chance to attack all foes. 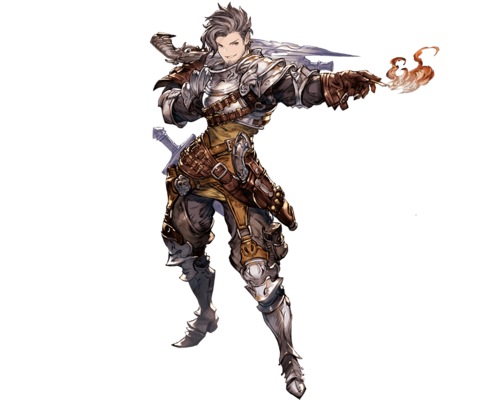 Rackam cannot gain more than 3 Spitfire stacks. 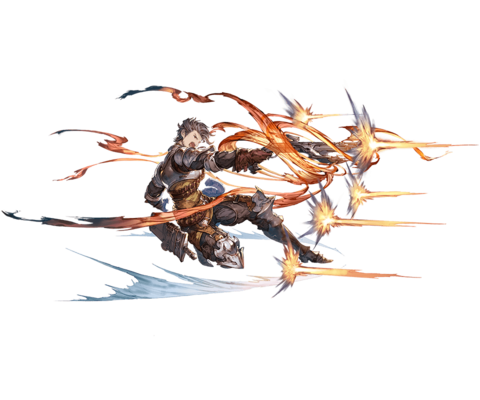 The duration of the buff will not refresh anymore upon activation when Rackam has 3 Spitfire stacks. The 35% mode bar cut is based on the current mode bar rather than a fixed 35% of the total mode bar. This page was last modified on 26 February 2019, at 05:33.